From basic research to clinical applications, our SpyFi Cas9 Nuclease delivers greater editing efficiency and reduced off-target effects without loss of on-target activity to help accelerate your CRISPR-Cas9 gene editing program. SpyFi Cas9 Nucleases are available at Research Grade, GMP-SourceTM and GMP levels. SpyFi Cas9 Nuclease is uniquely positioned to satisfy a wide range of needs from basic research to clinical applications. 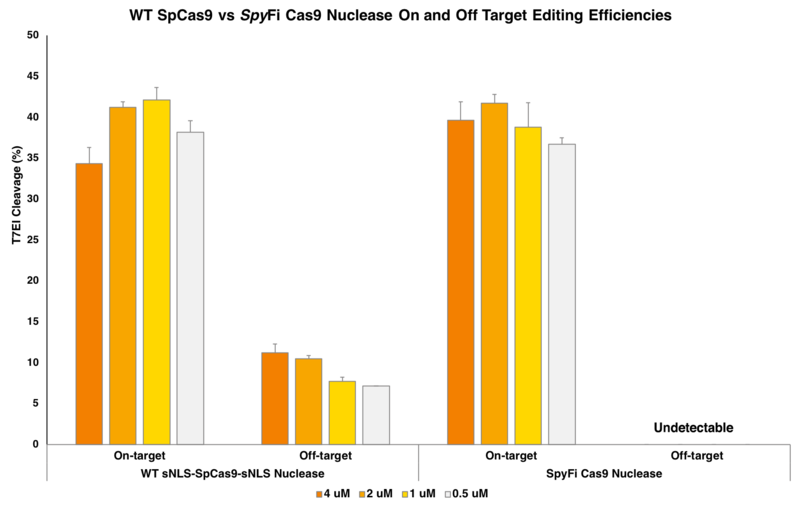 When used in combination with effective guide, target site and double-stranded DNA cut strategies, SpyFi Cas9 Nuclease delivers greater editing efficiency, higher fidelity and less off-target activity than wild-type SpCas9 nuclease. Aldevron’s SpyFi Cas9 Nuclease is sold under license of patents and/or patents pending from Integrated DNA Technologies, Inc. (IDT). Data shown above was generated in collaboration with IDT. To download your CoA, please provide your contact information. We do not share your information with any third parties.